Ignore the other comments/reviews they aren't worth reading. This is an AMAZING Dark Electro album. While not purely Dark Electro, it comes pretty close. Distorted vocals and synths, this album is for me the successor to Front Line Assembly's later more Electronica kind of stuff. It mixes very well the eletronica vibe and the dark cold Dark Electro synthlines with more of a beat driven pulsating (This is better than Goa/Psy-TRance btw) electronic sounds. Do not miss it, its worth for all Evils Toy fans. For people saying its has some Techno in it, let me ask you this. Didn't FLA's later stuff include some more Techno-related design choices? This goes exactly with what I said that the album reminds me of FLA's later Electronica and Techno influenced sound (Hardwired, Tactical Neural Implant, FLAvour of the Weak, etc) and it goes good when its trying just that. Cannot recommend this enough, not as good as the older releases but still pretty damn fine and even I would say amazing at what it does. 5/5 Stars! (Don't know how to that funky star emoticon thing, but you get my point) 5/5 Stars! Get it if you can! Especially if you appreciate Dark Electro kind of music! Refined, yet accessible techno industrial filled with energy infused melodies and 4 on 4 beats. While at times this album sounds dated, it tends to remind me of the old skool German trance days at Tresor, certainly a good place to start. This is a perfect example of where techno and industrial crossover. The music is built for the dancefloor, with every track being very listenable as a single itself, all with an edge of vocal industrialism. Excellent release and probably the best album from Evils Toy. The title track on this album is fantastic, really showed the potential of this group... unfortunately some of the other tracks fall short. 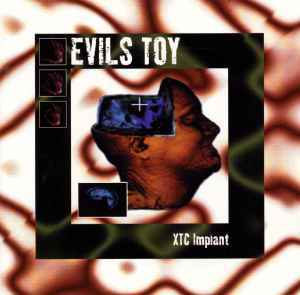 Overall though this is probably the best Evils Toy album, it mixes the industrial style with some mild techno and the vocals aren't so bad on this.